When my son’s therapist brought up that she thought he might be autistic, I didn’t believe her at first. Why would I? My son could talk. He looked at people’s faces (when he had to). He never flapped his arms. Surely, my son wasn’t autistic. 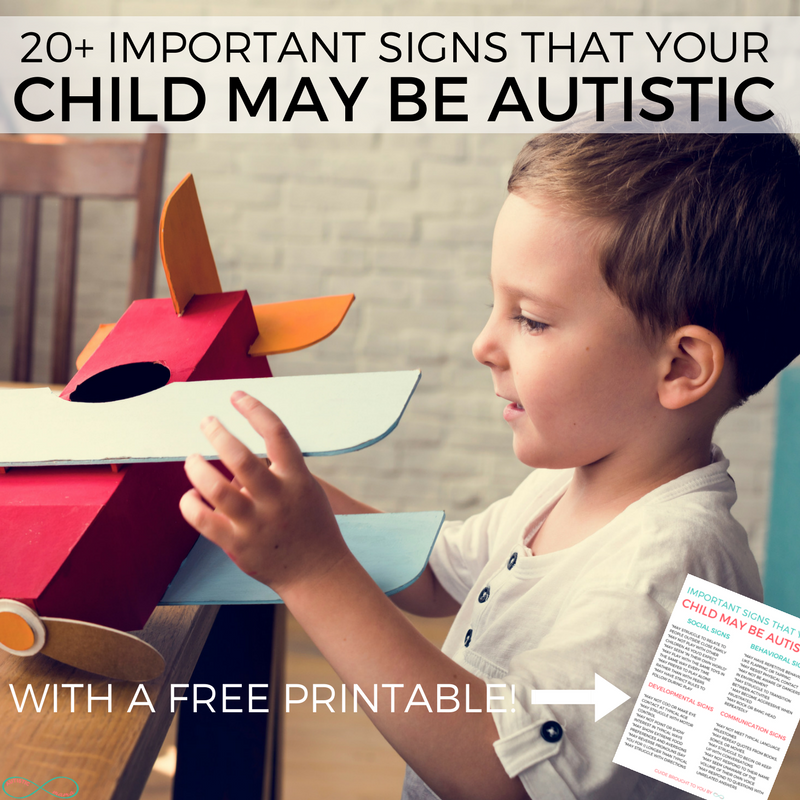 I learned pretty quickly that the important signs that your child may be autistic aren’t always the stereotypical signs that you may be used to. See, “flapping arms” is just one of many ways that autistic children may stim. And some autistic kids can talk or look at people, even if it’s uncomfortable for them. Thankfully, I’ve learned a LOT about the signs of autism over the last few years. I even learned about my own autism as an adult and mother! So today I thought I’d share with you these 20+ important signs that your child may be autistic so that you can find some real answers. As a bonus, I also put together a quick autism signs cheat sheet free printable for you, so that you can use it to refer back to again and again (like if you need to take it to a doctor appointment or therapy evaluation). Now some of these signs you may already know, and some might be new to you. It’s important to read this list with an open mind. Some things might seem like “all children do that” or some may not pertain to your child’s autism. Not every autistic child will do all of these things, and not all children who do these things are autistic. This is simply a guide to help you if you’re new to autism and are unsure of what to look for. I’ve decided to split these signs up into the major categories: social, developmental, behavior, and communication. One of the biggest autism stereotypes is that we’re “anti-social”. But what in the world does that even mean? A lot of autistics I know are very social, we just tend to socialize differently than neurotypical people do. There are definitely some social signs of autism in children that parents can watch for, so I’ve outlined a few of them below. First, autistic children may struggle to relate to people outside of their close family. It takes us a while to connect with new people, so we’re often most “ourselves” with close family. Autistic children also may not play with other children as you might typically expect. Autistics tend to prefer “parallel play” where they play near other children without directly interacting. Your child may also seem like they are “in their own world” a lot of the time. Maybe they don’t respond when called or seem to zone out. One of the biggest signs for my son, A-Man, was that he played with the exact same toys in the exact same way every time. He liked his routine and playing in a way he knew that he enjoyed helped him to feel safe and in control. You may also notice that your child prefers to play alone, rather than with peers. Autistic children tend to be very specific in their play, and adding in other children adds a lot of uncontrollable variables. Autistic children may have extremely strict rules to follow during play. 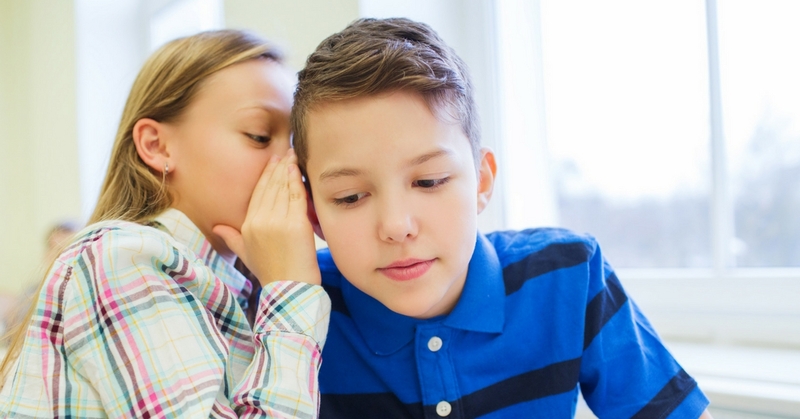 They may tell you exactly what you need to say (or just expect you to know what to say). They may get very frustrated when someone isn’t playing “right”. The developmental signs of autism in children are the most likely to be picked up by your child’s pediatrician. That is, unless your pediatrician is like A-Man’s that blamed his delays on our parenting. The first developmental sign is one that happens so early, that most parents notice it retroactively after their child gets an autism diagnosis. See, as a baby, many autistic children may not coo or make eye contact at the typical age. 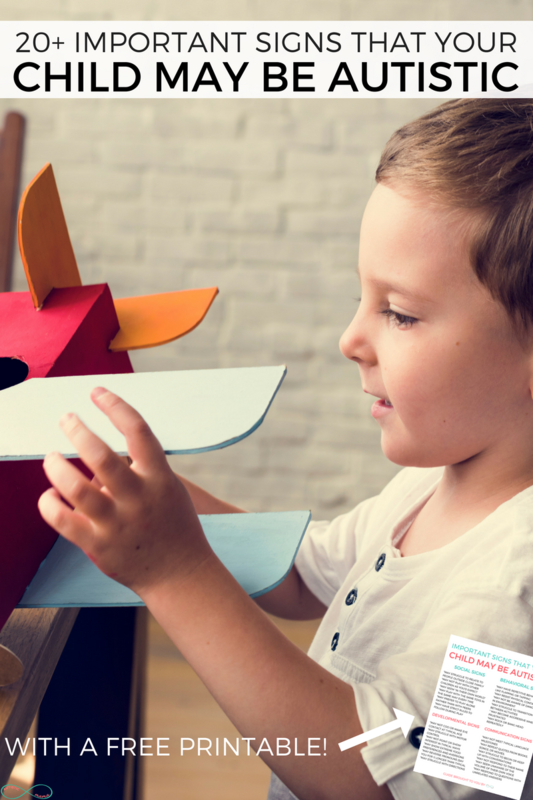 Autistic children may also struggle with motor control, both gross motor and fine motor. A-Man struggled with certain gross motor milestones like jumping with both feet, as well as fine motor skills like holding a pencil. You may also notice that autistic children may not point or show interest in typical ways. It isn’t that we don’t notice things or have interests, we just don’t always think to share them with the others around us. One of the biggest signs most parents notice is that autistic children may show extreme food preferences and aversions. Now, I’m not talking picky eating and not liking onions in their food. A-Man had a legitimate phobia of pasta as a toddler and preschooler. Even still, he cannot handle eating pasta, but he can see it on the table without struggle. 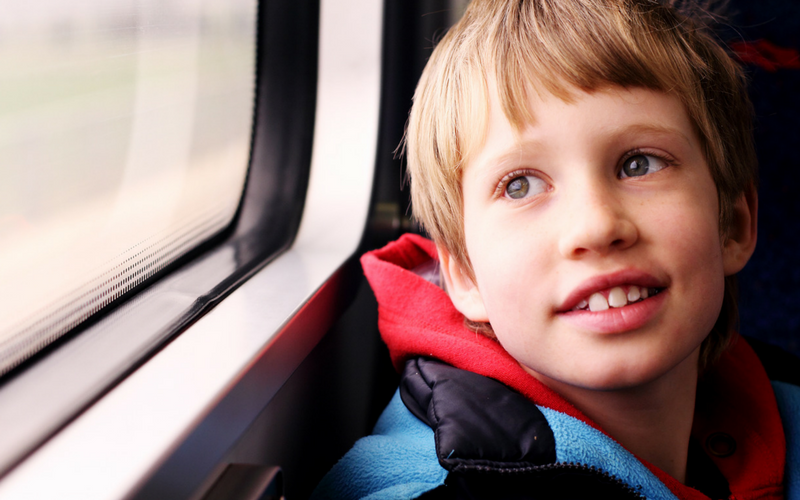 Autistic children may also reverse pronouns longer than typical children. For example, they may say “you” instead of “I” often. This is because most autistic children who speak do so by copying scripts we hear others use. And finally, autistic children may struggle to follow directions, even simple 2 and 3 step directions. Sometimes it’s a struggle of understanding and processing that much language. Other times, autistics struggle with demand avoidance caused by anxiety. Autistic children’s behavioral signs are typically the most widely known, but sometimes they aren’t as widely understood. We do have certain behavior signs of autism in children to watch for, but it’s important to also see where this behavior may come from. Autistic children may have repetitive behaviors like flapping their arms or tapping their feet. These behaviors are called “stimming”. We stim because it helps us calm down, show our excitement, show that we’re overwhelmed, and more. 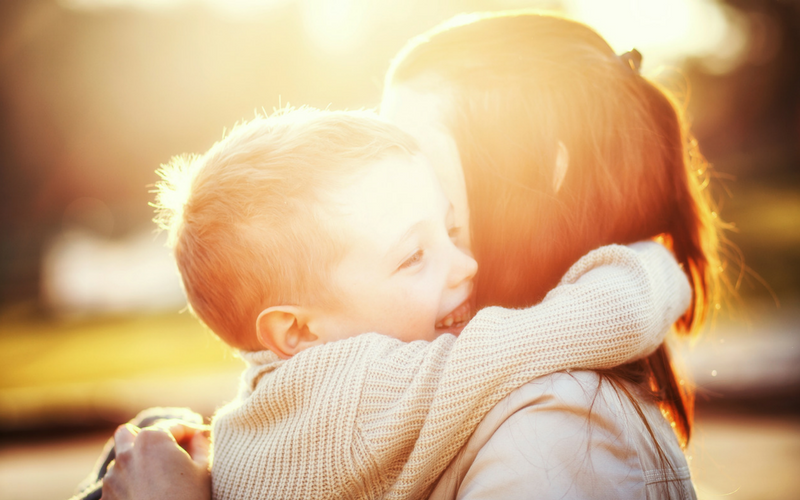 You may also notice that your child seems to resist physical contact. Physical stimulation can be extremely overwhelming for autistic children, so often they’re okay with physical contact if they initiate but not when others initiate. Autistic children may also struggle to transition between activities. Our brains can hyperfocus on what we’re working on, so when we’re expected to stop that and move to another activity it can lead to meltdowns. Another behavior sign of autism in children is that they may not seem aware of dangers in their environment. You might see your child bolt or run out into the road, seemingly unaware that a car could hit them at any time. 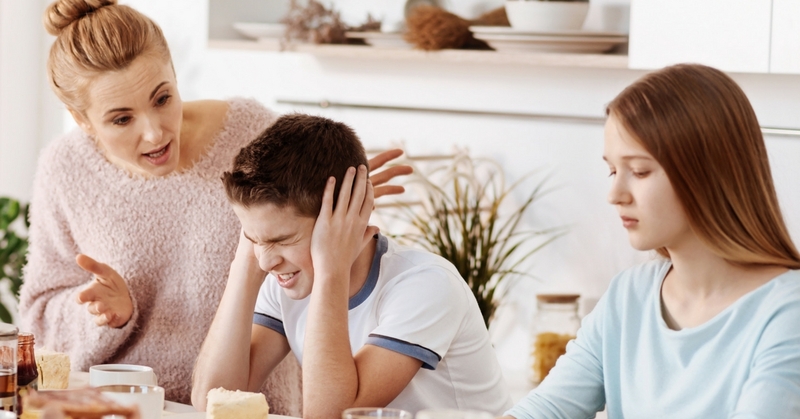 Autistic children also may become physically aggressive when frustrated. It’s vital to know that autism does not make a child violent, but when an autistic person is frustrated and cannot communicate their needs, they may respond with aggression. And finally, autistic children may often rock or bang their head repeatedly. These behaviors help autistic people to get sensory input that they desperately need. We learned about my son’s autism after begging our pediatrician for a speech therapy referral. We knew he wasn’t communicating like a typical child would, and we wanted to help him communicate to lower his frustrations. See, autistic children often have significant communication struggles and delays, sometimes to the point of not speaking at all. The first thing most people notice in autistic children is that they may not meet typical language milestones. You may notice that your child often repeats quotes from books, songs, or movies that they have seen or heard. My son used to quote the Tinkerbell Pirate Fairy movie constantly. An autistic child may also struggle to begin or keep up with conversations. Beginning a conversation takes several expressive language skills that many autistic kids struggle with, and keeping up with a 2-way conversation can be overwhelming and exhausting. You might also notice that an autistic child may not respond to their name. Sometimes this is because they are so engrossed in an activity that they block out other noises, and sometimes it’s because autistic children don’t develop the same familiarity with their name that other children do. Another common communication sign of autism in children is that they may seem completely unaware of the volume of their own voice. A-Man is often yelling or whispering without realizing that he’s doing it, or realizing how those different volumes affect those around him. And finally, you may notice that autistic children tend to respond to questions with unrelated answers. Listening to a question, processing the words to find the meaning, deciphering the type of answer required, searching through your brain to find the right words to use to answer, and then physically saying them is exhausting and overwhelming. So autistic children will often shut down when asked a question and give you a non-sense answer instead. 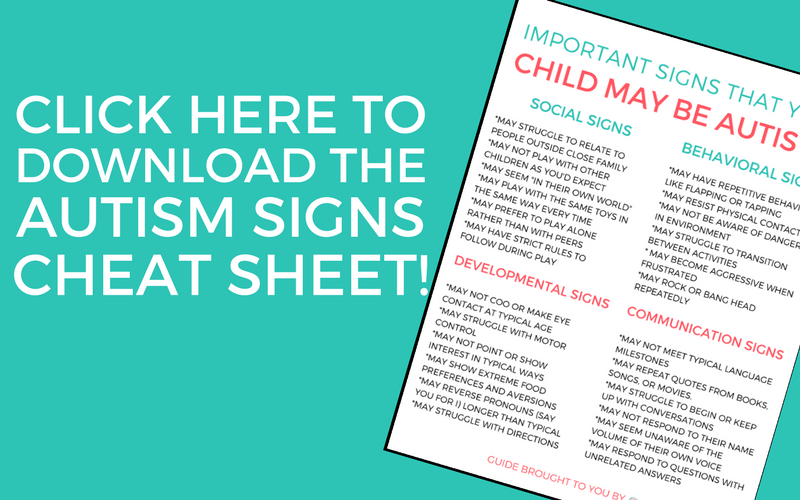 I know that we just covered a TON of information, and I want to make sure that you have a simple way to check the important signs that your child may be autistic, so I created a free printable cheat sheet just for you! With all of the signs listed and broken up by category, you can easily use this and highlight those that fit your child. Bring this to the pediatrician’s office, your IEP meeting, or to a therapy evaluation so that you have a visual reminder of what you’ve noticed at home with your child. To download your printable cheat sheet, you just need to click the image below, answer a few super simple questions (seriously, this takes less than 2 minutes I promise!) and your cheat sheet will hit your email in no time! My 9yr old is autistic an doesn’t fit the description of most of these but my 2yr old is not autistic an fits into just about all of these.